Justice H.A. Nganjiwa of the Federal High Court, Port Harcourt, Rivers State, on Friday convicted Frank Emem and sentenced him to 10 years imprisonment for internet-related offences. The judge found him guilty of two charges of obtaining money by false pretences brought against him by the Economic and Financial Crimes Commission, EFCC, and sentenced him to 10 years imprisonment on each count, without an option of fine. The sentences are to run concurrently from the day of his arrest, 6 March, 2013. The Judge also ordered him to pay the sum of N2,500,000 in restitution to the victim. 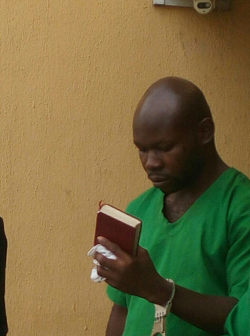 Emem was arrested for defrauding a Chinese, Wang Xin of N2 500,000. The convict cloned the e-mail account of Vhelbherg International Limited and sent mails to Wang Xin, a client of the company, demanding for the said sum. The money was then paid into the Diamond bank account of the convict. One of the count reads, That you, Frank Emeh and Peter Njoku (now at large) on or about December 2012 in Port Harcourt within the jurisdiction of this Honourable court did conspire among yourselves to commit felony to wit: obtain money by false pretence from Sinopec Changjiang Engineering Services Limited by using a false e-mail address trutobingsolutions@yahoo.co.uk to communicate with him making him believe that you are one of his client and thereby committed an offence contrary to Section 8 (a) of the Advance Fee Fraud and Other Related Offences Act 2006 and punishable under Section 1 (3) of the same Act.